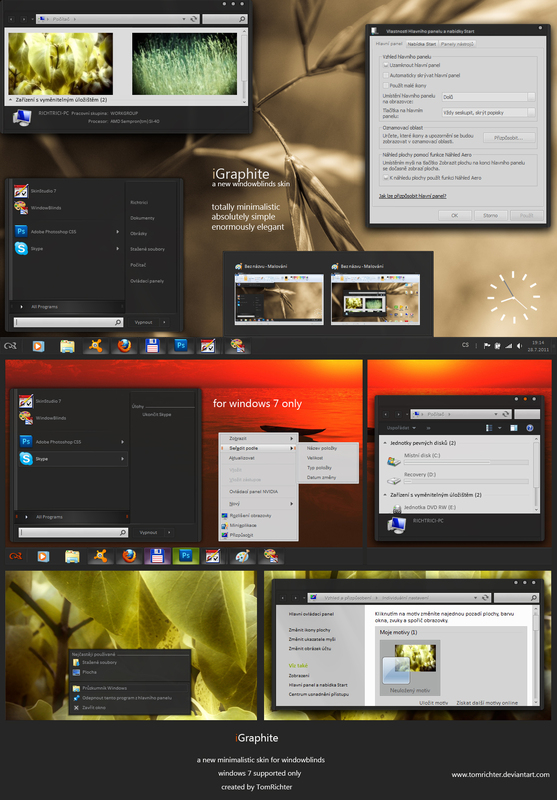 I am happy to present iGraphite, my new skin for windowblinds 7, a crisp and elegant yet simple theme for every day use. When designing the skin or in fact when thinking of what I could do I remembered some Ubuntu styles or even Mac. These stuff are very elegant. This is my attemt to bring some fresh feel by the minimalistic skin to your desktops. Let us hope I will succeed. All I wish is that you will enjoy this skin as much as it is possible. Thanks for any comment to leave here or any faves and download. Congratulations on finishing this one, Tom. It looks very clean. Tom - Oh, yes. Oh, yes. Thanks everybody, I do appreciate that. Thanks Karen, actually I have to be thanking you as I saw several setups of yours and found the first wall to fit perfectly. Artistic Minimalistic Looks like a Masterskin.